The final of the inaugural Club Team Championship was held on Friday evening under the floodlights at Noble’s Park in front of a good crowd. Marown reached the final after sailing through their group games, whilst Onchan came through a tough group, sealing their place in the final after seeing off South Ramsey with a convincing win in their final group game. 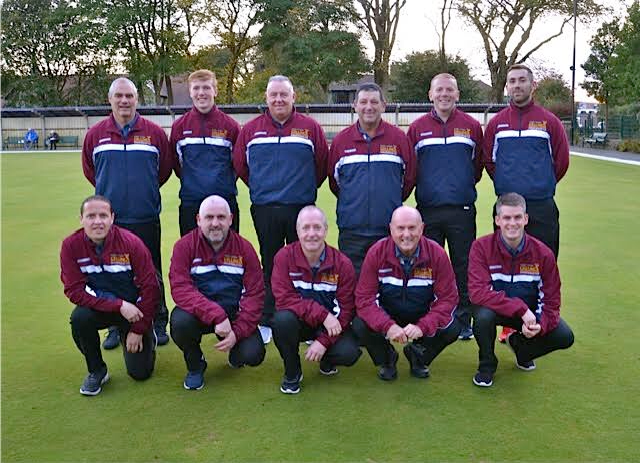 Marown started the final as favourites, and with the format being five singles games and three doubles games the draw would be crucial to Onchan’s hopes of pulling off an upset. First off for Marown was Matthew Keggen winning 21-12 against Colin Spence, with Spence staging a mini-comeback after being 4-16 down before losing out. The first doubles game off was Paul Kelly and Neil Withers who were up against Kevin Quirk and Peter Slinger with the Marown men seeing off the Onchan pair 21-14 in a high quality game. Third game off was another doubles game with Harry Barton and John Kelly performing well to beat Mark Kelly and Edward Carlyle 21-10. The last game off from the first half of the match was another Marown win with Brian Kelly beating Bernie McPhee 21-18, which was the closest game of the night. At the halfway stage, the chalks were 84-54 with Marown holding a 30 point lead. Fifth game off on the night was Peter Kelly who helped increase Marown’s lead to an unassailable 44 chalks thanks to a 21-7 win over Mike Alexander. Onchan replied with the biggest doubles win of the night with Jordan Cain and Rob Monk playing the short lengths well to seal a 21-8 victory against the experienced pairing of Phil Kelly and John Gelling. With the match now secured with Marown having scored enough chalks in the two games left on the green, Onchan then recorded their second win of the night with Matthew Quirk holding off a strong challenge from Juan Killip to record a 21-17 win. The last match of the night was between Colin Kelly and Neil Dunwell with Kelly recovering from 2-8 down to eventually win 21-15. Marown won by 33 chalks (151-118) winning 6-2 on games. The presentation was made by Association Press Officer Glynn Hargraves who congratulated Marown on a deserved win, whilst also thanking Noble’s Bowling Club for hosting the final and providing refreshments. Marown’s Neil Withers then accepted the winners shield and also congratulated his team and thanked their supporters. With his Association hat on Withers then gave a bit of background to emphasise why the competition was introduced, with the idea of increasing involvement from across the teams within a club and also to help create a better atmosphere around the green.